According to the official credits, Ex Machina was Alex Garland’s directorial debut and Annihilation is his follow-up film. But depending on who you ask, Dredd was Garland’s actual debut making Annihilation his third directed film. No matter what way you slice it though, Garland has consistently delivered for me and is one of my favorite filmmakers out there. Jumping ahead straight to the rating, Annihilation completes the hat trick of 5 out of 5 star films for Garland. I don’t know what it is about his work, but he always seems to nail the right balance between showing and telling. While a film like Ex Machina was fairly straightforward, albeit with twists and turns and forcing you to think about what you see, Annihilation is much more roundabout. There’s seemingly a clear goal established at the outset of the film — meteor strikes a lighthouse and causes weird things to happen, named “The Shimmer”. The goal is to reach the lighthouse to find the cause and stop the shimmer. But the actual start of the film is in the future with Lena (Natalie Portman) being debriefed after having returned from the mission to the lighthouse. Then there’s flashbacks and other time jumps and just one big mind-bend. It’s a bracing brainteaser with the courage of its own ambiguity. You work out the answers in your own head, in your own time, in your own dreams, where the best sc-fi puzzles leave things. Comparisons may not be the best way to write review, but I usually find it the most helpful, especially if you’ve seen the comparison films before. And another film that’s comparable to Annihilation is Arrival, both story-wise but mainly experience-wise. Arrival also dealt with an outer-space object disrupting proceedings on Earth, but with spaceships instead of a meteor. Both films had groups of scientists head into the affected area (the spaceship and The Shimmer) to try and solve the problem. But the reason to compare the two films is because of the puzzles. To repeat Travers’ quote, “You work out the answers in your own head, in your own time.” Arrival and Annihilation both do extraordinary jobs at delivering a problem and guiding you, along with the characters, to a solution, or at least to a path that contains the answers. It’s a shame Annihilation is bombing at the box office. Perhaps the studio execs were right that the film was “too intellectual” and “too complicated” for audiences to grasp. For me, Blade Runner would fit that category perfectly; that’s a film that I had no real clue what was going on half the time, even with repeated viewings and watching the versions with and without narration. 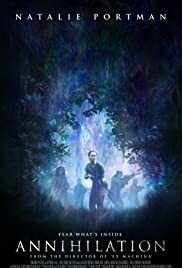 Annihilation is kind of pseudo-that. It is indeed complicated and intellectual, but it’s not out of reach, at least from my perception of it. Maybe there’s a lot I’m missing or don’t understand. At least I can say I enjoyed what I did see and what I do understand. The worst-case? I watch a film I enjoyed a lot again and again and gain new insights each time. That sounds like a fantastic film to me.